In this report, we gathered 235 professionals who identified as working within the construction, building or architecture industry. Most of the respondents consisted of contractors (49%), construction managers (26%) and architects (9%). The majority of respondents (around 75%) either graduated college or held postgraduate degrees. 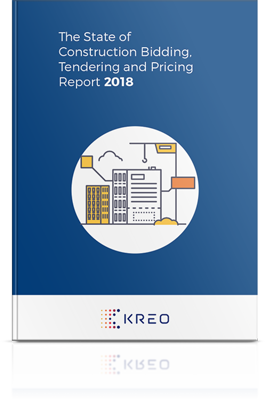 This research influenced Kreo's products and led us to write about how AI is positively impacting construction. Complete the short form below, hit ‘Download,’ and gain immediate access to our report. 74% of respondents say they work on more than 5 projects a year, with more than a third of these saying they work on 10 or more. 41% of respondents say they typically work on projects with a full BIM model, as opposed to architecture (34%), structural (22%), MEP (3%). 50% of construction project scheduling is done using Microsoft Excel. The fact that HALF of construction project scheduling is done using a tool totally unsuitable for the purpose is truly remarkable. 33% of respondents say they use BIM software for cost estimating, 27% use it for bill of quantities, whereas 40% say they use it for construction scheduling. Quantity Takeoff: How Long Does It Take? 13% of respondents say it takes less than one week to create a bill of quantities for a typical project. 49% say it takes them 1-2 weeks. 30% say it takes them 3-4 weeks. 8% say it takes 5 weeks or longer. For almost 9 out of 10 typical construction projects it takes longer than 1 week to create a bill of quantities - with three quarters taking between 1 and 4 weeks. Cost Estimation: How Long Does It Take? 25% say it takes less than a week to prepare cost estimates. 46% say it takes 1-2 weeks. 25% say it take 3-4 weeks. 4% say it takes 5 weeks or longer. 30% of companies say they participate in 1-4 tenders per year. 36% say they participate in 5-9. 14% of them participate in 20 or more. 59% of construction companies say they use software for running tenders. When it comes to tender contracting options, 26% say they use design-bid-build, 24% say design-build, and 49% say construction management. Bid Preparation: How Long Does It Take? 30% of construction companies say it takes them less than 4 weeks to prepare a bid. 45% say it takes 4-6 weeks. 20% say it takes 7-8 weeks. 3% say it takes 9-10 weeks. 2% say it takes 11-12 weeks. For 7 out of 10 typical construction projects, bid preparation takes longer than 4 weeks. This illustrates the extent to which construction companies become immersed in the heavy lifting of bid preparation, making it difficult for them to adjust and refine models, timelines, cost estimates and quantities. 37% said it would be between $50,000 and $99,999. 16% said it would be between $100,000 and $499,999. 3% said it would cost $500,000 or more. Tendering: How Many Parties Involved? When asked how many contractors participate in a tender, over 83% said it would be 19 or less. 2% said 50 or more. We asked what were the main challenges faced when running a tender, and allowed respondents to select up to three answers. What are the main challenges faced by construction companies when participating in a tender? 19% said they struggled due to insufficient time. For 15% it was assessing risks. 13% said they faced undesirable budget terms. 13% cited undesirable timing terms. 11% said they struggled with assessing commercial viability. 11% cited lack of resources. We wanted to find out how contractors and subcontractors are most commonly selected. 52% of companies say they have a pre-approved list to work from. 24% say they use framework agreements. 1% rely on either client recommendation or experience working with certain subcontractors. 42% said BIM models simplify the process. 37% said the ease of processing documentation. 21% said it speeds up the process. Over half of construction project stakeholders say time constraints are the greatest challenge they face in completing their work each day. 12% cite lack of proper applications. 12% say lack of necessary software. 11% say lack of proper tools is their biggest challenge. 3% believe they don’t get enough management support.